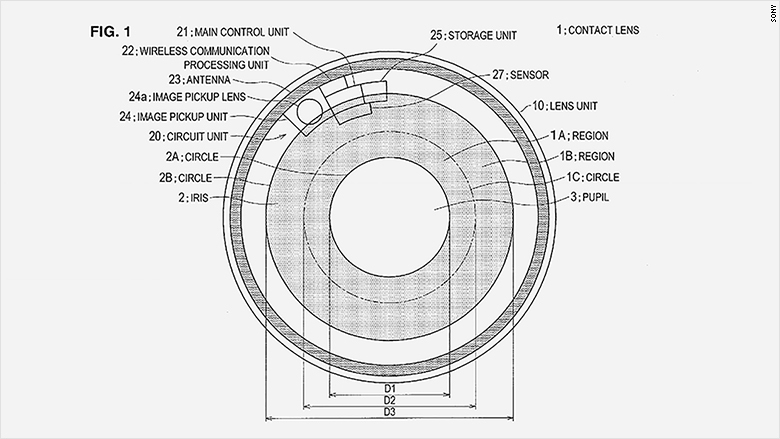 A contact lens that acts as a digital camera? Eyes have become a hot “next frontier” in technology. The failed Google Glass was just one of many stabs at face-mounted computers. Microsoft and other companies are working on augmented reality headsets, which overlay computer imagery onto the real world. Other companies, such as Sony and Facebook’s Oculus, are working on completely immersive virtual reality goggles. These are all just patent applications and don’t mean you’ll be able to pick up a new DSLR-eye anytime soon. The black and white line drawings of fantastical future technology are a common bit of business for these companies, and on the off chance the ideas do become real technology, it could still many years away. We’re certainly not counting on this anytime soon but thought you might find this interesting. Here’s the article at CNN.